This set of 4 boards expands the functionality of the STM32F4 Discovery kit. A base board, connected to the STM32F4 Discovery provides Ethernet connectivity, a micro SD Card™ slot and extension connectors for the LCD and camera boards, and provides easy access to features such as UART, SPI, CAN and so on. The Wi-Fi board connects to the STM32F4 Discovery using serial host interface (UART or SPI). 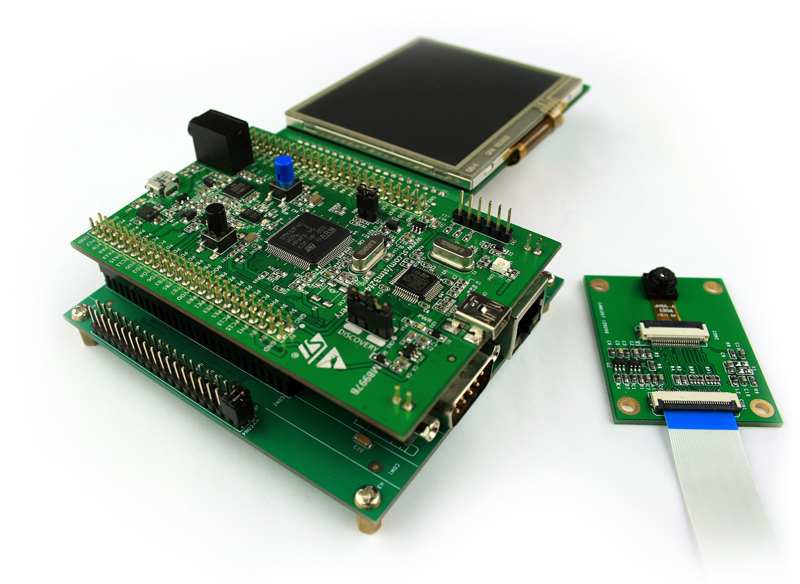 A digital camera board featuring a 1.3 Megapixel CMOS sensor, a 3"5 LCD board with touch screen capability connected to the base board along with a Wi-Fi board featuring the SN8200 Wi-Fi module form a complete system. Frame rate: 15 fps for SXGA, 30 fps for VGA and CIF.